I was doing a search in Houdah Spot when I realised that there are hundreds of megabytes of video files in Skype Application support directory. On checking thes evideo files, they are MP4-encoded memes. What that actual bloody hell is that for ? 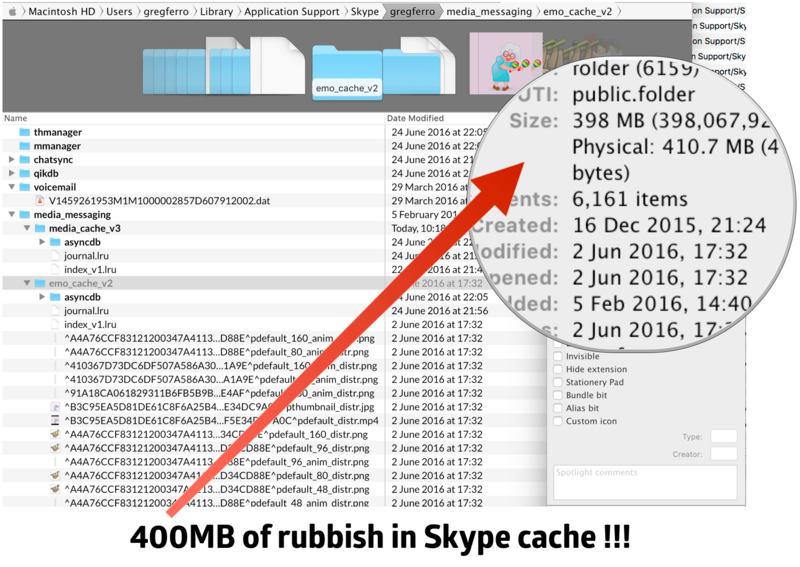 So I deleted both the media-cache_v3 and media_cache_v3 directories (I need that space for real work).When I restarted Skype it promptly downloaded 200 Megabytes of emoticons from Azure. Luckily I was not running on a 3G/4G modem as I sometimes do. I haven’t been able to find a way to ditch this 200 megabytes of emoticon cruft that Skype forces me to download and bloat the disk drive on my computer, if you find out, please let me know. I mean, normal software developers would use the emoticons provided by the operating system. Why the heck are they downloading hundreds of megabytes of cruft! !